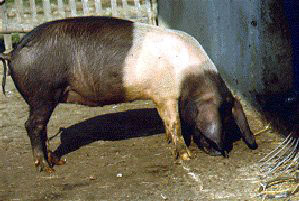 The Krskopolje or Blackbelted pig is the only Slovene autonomous pig breed. In general the Carniola and Styria regions of Slovenia were dominated by a darker pig breed for a long time. But gradually it began to cross-breed with whiter (lighter) breeds. In the second half of the nineteenth century many Suffolk boars were imported to Carniola and Berkshire and Yorkshire boars to Styria region. The first comprehensive description of the Krskopolje pig was published at the end of the previous century by Rohrman (1899). He emphasized the strongly developed pig production in the Lower Carniola region (Dolenjska), particularly in the area of Krsko polje. The back part of the body of those pigs was usually black, while the front part was more or less white - in the form of a wide white stripe or belt around the body. The head was medium-length and flat, with big, hanging ears. The breed is characterized by an average fertility, a good appetite, growth ability and large adult weight (adult animals weighed 250-300 kg). The later description of the breed is dated to the time immediately before World War II. On the occasion of an agricultural poll held in 1938, Oblak reported about pig breeding and, among other things, mentioned the following:"... Today the primitive Krskopolje pigs are no more to be found as a pure breed. However, we can find remains of the primitive breed in the most remote parts of the country, where pigs, as for their outlook, color and several measures remind of this breed. The Krskopolje pig distinguished itself especially by its ability for producing fat as well as meat of excellent quality. This pig is more and more left off. The main reason for this is to be found in the fact that the Krskopolje pig because of its too small region of presence, inevitably had to degenerate as inbreeding occurred. The breeding region should be extended and the unified breed introduced, which would be the right thing to do, also from the professional point of view." After World War II important research work has been done on the Krskopolje pig in the fifties and sixties. In 1956, an unknown author described the development and biological traits of the breed. He especially emphasized their modesty, fitness and meat quality. He has also emphasized the detrimental effect of inbreeding. At that time the first professional measurements of fertility, growth ability and meatiness of the blackbelted pig were done. Eiselt and Ferjan established in 1972 that first description of the blackbelted pig by Rohrman is strongly deviated from the pig known from the periods between the two world wars and after the World War II. They have mentioned their research reports in their summary: " At present, there is variability within breed in exterior, constitution is severely weakened. At relatively high number of piglets born in one litter (10.07), there is a considerable number of stillborn piglets (2.13). The losses in the suckling period until weaning are high (26 %), which makes the number of finally reared piglets rather small (5.87)." The authors also noticed the differences concerning the form and size of the head and ears. 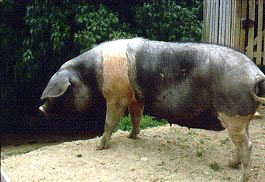 They presumed that changes originated from cross-breeding of the first blackbelted pigs with English (Berkshire, Cornwall) and other pig breeds. In the period between 1990 and 1992, it was investigated how many Krskopolje pigs can be found in the areas of Gorjanci, BrePice and Krsko polje. They found some remains of the breed. After the year 1992 work on preservation of the Krskopolje pig is continuing.